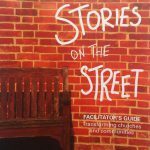 Stories on the street is a resource to help churches in the UK to engage with and work alongside their communities to bring transformation. It is written in 6 modules on the themes of vision, celebrating what we have, a heart of compassion, building relationships, understanding our community and stepping out in faith. Each module contains in depth creative Bible studies and practical participatory tools that can be used with church and community members to make life better for all, particularly the vulnerable and marginalised.